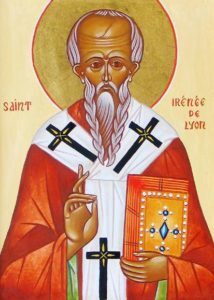 June 28 has been set aside on our liturgical calendars to remember Irenaeus of Lyons. His name means “peace,” and the English word irenic comes from the same Greek word as his name. It is also the source of the woman’s name, Irene. He lived from around 130 to 200 AD and is believed to be a native of Smyrna (modern Izmir, Turkey). He studied in Rome and later became pastor in Lyons, France. Lyons, in the second century, was an important commercial city, the seat of a Roman garrison and headquarters for three provinces, a gateway between the Mediterranean world and the provinces north of the Alps. Like Rome, Lyons had a large Greek-speaking element in its population, and it was among this group that Christianity was first established. During the Montanist controversy (the Montanists were an apocalyptic party that expected the immediate outpouring of the Holy Spirit), Irenaeus was sent as an envoy to Rome by the Christians at Lyons. In his absence, a fierce persecution of Christians led to the martyrdom of their bishop. Upon Irenaeus’s return (around 177 AD), he became the second bishop of Lyons. Little is know of his later years, including how he died. Among his most famous writings is a work condemning heresies, especially Gnosticism, which denied the goodness of creation. In opposition, Irenaeus confessed that God has redeemed his creation through the incarnation of the Son. Irenaeus also affirmed the teachings of the Scriptures handed down to and through him as being normative for the Church. This defense against heretics with novel ideas provided by some sort of “special” knowledge remains the bulwark of the Church today. The Bible is our Faith’s solid foundation. Because Irenaeus provided lengthy quotes from the heretics he opposed and whose works would otherwise have been lost, we have a much clearer understanding of what they believed. (In fact, until rather recently when such finds like the Dead Sea Scrolls, almost all we know about these early splinter groups was from Irenaeus.) He also provides us a clear witness to the New Testament books that were received in his day and age. They are the same we have today. He clearly taught that “the ground and pillar of our faith” is the Scriptures “handed down to us” “by the will of God.” Unlike many of his contemporaries, Irenaeus was raised in a Christian home, taught and probably baptized as an infant by Polycarp (see February 23). Polycarp was a student of the Apostle John. Prayer: Almighty God, You upheld Your servant Irenaeus with strength to maintain the truth and to bring peace to Your Church: Keep us, we pray, steadfast in Your true religion, that in constancy and peace we may walk in the way that leads to eternal life; through Jesus Christ our Lord, who lives and reigns with You and the Holy Spirit, one God, now and Forever. Amen.